According to KCRA.com, a three-alarm fire has destroyed the Sacramento recording studio of '80s rock band Tesla and a neighboring apartment building. The blaze, which broke out just before 2 a.m. this morning (9/30), has destroyed band memorabilia and gear. The cause of the fire is under investigation. Watch video news coverage of the fire here. 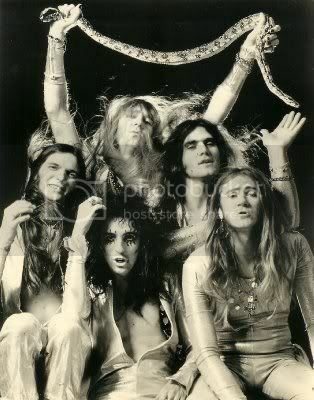 Alice Cooper, the Beastie Boys, and Bon Jovi top the list of 2011 nominees for the Rock & Roll Hall of Fame, it was announced yesterday (9/28). Also on the list are Chic (featuring legendary funk guitarist Nile Rodgers), Neil Diamond, Donovan, Dr. John, J. Geils Band, LL Cool J, Darlene Love, Laura Nyro, Donna Summer, Joe Tex, Tom Waits, and Chuck Willis. KISS - not a fan, but they are one of the biggest rock bands in history. Rush - 24 gold records, 14 of them platinum, puts them behind only the Beatles and Rolling Stones. Who are these nincompoops ...er ... voters? Yes - Arguably the most influential progressive rock band of all time, but apparently music that makes you think is simply too much for most. OK, the soapbox is yours ... Who do you think should be in? Together for over 40 years and touring steadily since 1974, Canadian power trio Rush has played to millions and millions of fans across the globe, and on November 4, at the Billboard Touring Awards ceremony in New York City, the band will receive the 2010 Legend of Live award. Previous winners include Ozzy Osbourne (2009) and the Allman Brothers Band (2008), among others. The band's recent Time Machine tour played 45 mostly sold-out shows in the U.S., Canada, and South America, and over the last five years alone, they've moved more than two million concert tickets. "Rush is uniquely deserving of this award as they have a remarkable body of live work that altered the course of rock music and raised the bar as to what can be done onstage, and have a continued commitment to playing live," says Ray Waddell, Billboard's executive director of content and programming, touring and live entertainment. "From the early days in the bars and clubs of Toronto to stadiums, amphitheaters and arenas around the world, Rush have epitomized professionalism and the spirit of live rock 'n roll, and they boast some of the most passionate and loyal fans in rock." For many years, whenever I played blues, I relied way too heavily on the minor pentatonic and blues scales, not to mention a handful of my own stock licks. Then I'd hear a B.B. King solo and wonder how he could make the blues sound so sweet. Turns out, B.B. was playing notes that many beginner and even intermediate guitarists don't know are allowed in a blues solo. Basically, the King of the Blues was combining the Mixolydian mode with the blues scale, to create the hybrid blues scale. In music theory terms, it simply means adding the major 3rd, 6th, and 9th intervals to the blues scale, so that you get a nine-note scale that, in the key of C, looks like this: C–D–Eb–E–F–Gb–G–A–Bb. You can hear King's use of these "major" notes throughout his repertoire, but one of my favorites is his solo in his 1966 slow blues "Sweet Sixteen." To illustrate, I've combined several of B.B. 's signature moves in this week's lick. The lick, which is played at a tempo of dotted quarter note=60 bpm, starts in the Albert King box of the C# minor pentatonic scale with one of B.B. 's sweetest sounds—substituting the major 3rd (E#) for the more commonly heard minor 3rd (E). And the pull-off from the 4th (F#) to the major 3rd is an essential B.B. move, as are the consonant whole-step bends to the 5th (G#). After pausing for a "breath," the lick jumps up to the "B.B. box" for a gritty 1-1/2 step bend followed by a fiery descent down the box pattern before nailing the root (C#) with some buttery vibrato. The final stab of the high-octave root note and subsequent slide down the neck might not look like much, but when you hear it, you'll recognize it as one of B.B. 's favorite tools. Rather than use this as one big lick, play around with the three components separately, incorporating them into your own lines, and you'll soon find yourself out of the dreaded minor pentatonic rut. This past weekend, Paul Reed Smith Guitars welcomed more than 2,200 PRS enthusiasts from all over the world for the unveiling of six new electric guitars that will be part of PRS 2011 product offering. Several limited run amps and ground-breaking new guitar model appointments including an all new "V12" finish, new neck shapes, new pickups, and a high tolerance two-piece adjustable bridge. The weekend also included clinics, seminars, factory tours, master classes, and home recording studio demonstrations as well as performances by Ricky Skaggs, Orianthi, Zach Myers, Howard Leese, Davy Knowles, Martin Simpson, David Grissom, Cody Kilby, Bugs Henderson, and Derek St. Holmes, among others. Among the new guitars unveiled are the JA-15, which is studio legend Paul Jackson, Jr.'s first signature model PRS. "The JA-15 was designed with one goal in mind: to be the best-sounding hollow body guitar, period," said Jackson, Jr. "I believe that we have reached that goal. This instrument is not only one of the best sounding, but one of the best playing guitars I've ever picked up." PRS also showed their newest three-pickup guitars the DC3 and NF3, which feature proprietary PRS pickups and their all-new flat body shape for a classic look and sound. The new PRS McCarty 58 pays homage to legendary guitar maker Ted McCarty. It's a vintage inspired double-cutaway with a figured maple artist-grade top, V12 finish, and proprietary 57/08 pickups. PRS also unveiled the new vintage inspired singlecut SC 58 with similar appointments. There was an update to the brand's Modern Eagle series, as PRS debuted the ME Quatro, which features the V12 finish, 53/10 pickups, and "Pattern" neck shape. PRS announced the official launch of the SE Santana, which is the very first SE offered with a 24.5" scale length and is also the first SE created using the same silhouette as Santana's American-made model. The guitar will be in stores in October. Finally, PRS also expanded their highly touted amplifier line with several limited-run amplifiers, including the Experience PRS 2010 Recording Amp, a prototype of the company's first two-channel amp, and a very limited number of Sweet 16 and PRS "30" amps with special aesthetic appointments. For more info on all the new products shown at Experience PRS, visit www.prsguitars.com, and for first-hand coverage of the weekend and its products, visit the Facebook page of our friends over at Premier Guitar magazine. It seems that, outside of barn burners like Brad Paisley and Brent Mason, we sometimes don't give country music its due in this blog. But recently a couple of really good traditional country discs that probably won't get a lot of mainstream music press came across my desk, so I thought I'd share these gems with you. We've all heard the phrase "hot country" music, but what do you call it when it comes from the wintry wonderlands north of the border? Well, if you're referring to Now Before Us, the latest album from Ottawa, Ontario-based singer-songwriter Trevor Alguire, you might just want to call it "good country." Alguire, who in the past has been favorably compared to such roots music powerhouses as Steve Earle and Dwight Yoakam, pairs his charming voice and formidable songwriting skills with a stellar band that includes Dobro, pedal steel, mandolin, and banjo. Album highlights include opener "Are You Ready," which stirs echoes of Brad Paisley strummers; the uptempo traditional "Pen a Man Down," which features impressive mandolin work from Gilles LeClerc; and "Weeping Willow," which conjures hints of Led Zeppelin's "Hey, Hey What Can I Do." For more, visit www.trevoralguire.com. I'll be the first to admit I'm no connoisseur of old-style honky-tonk country record, but when Tele-master Redd Volkaert is holding down lead guitar chores, it gets my attention. A mix of old-time covers and consistent originals, the Lucky Tomblin Band's new album, Honky Tonk Merry Go Round (Texas World Records) is a traditional country album, without any real barn-burning excursions, and even though Volkaert can burn with the best, here he shows restraint and puts on a veritable double-stop laden and pedal steel–style clinic for fills and soloing over country strummers. Album highlights include "Wine," "She Loves Anything That Swings," and "The Other Side of the Blues." For more, visit www.luckytomblinband.com. PRESS RELEASE - EL CAJON, Calif. - September 23, 2010 - On par with many of fall's familiar traditions, Taylor Guitars is readying one of its own - the release of its anticipated Fall Limited Edition models. This year's Limiteds embody the extraordinary on several fronts: premium tonewoods led by figured mahogany and koa; new designs that include a deep-body Dreadnought and 12-fret Grand Auditorium; and fresh inlay concepts such as the "Twist," "Pipeline," and a laser-engraved Victorian motif. Taylor's electric line also yields a seasonal ode with an all-mahogany SolidBody Classic and T3/B that celebrate a vintage era. The GS Mahogany-LTD ($7,498) showcases a limited reserve (75 sets) of beautifully flamed mahogany that was harvested from hurricane blowdown. The guitar incorporates striking ebony accents in the form of a back mini-wedge, binding, backstrap and an ultra-premium beveled armrest. The armrest's elegant contouring softens the edge where the top meets the sides on the bass side of the lower bout, and blends comfort, functionality and aesthetic appeal. Unique appointments include an abstract "Twist" inlay design from Taylor's Larry Breedlove, which spirals and wraps between the 7th and 12th frets. Another premium touch on the Sitka spruce top is Adirondack spruce bracing, whose extra elasticity pairs with Taylor's proprietary CV bracing pattern to add sweetness and warmth to the guitar's tones. The 800 Series Limiteds are distinguished by modified body designs such as the 810e-LTD ($3,648), a non-cutaway, deep-body Dreadnought that yields a deeper, more robust tone, and the 814ce-LTD ($4,058), a 12-fret Grand Auditorium that offers an extra-rich voice. Also exclusive to this year's Limiteds, the 816ce-LTD ($4,058) sports a Florentine cutaway, while the 812ce-LTD ($3,898) incorporates a slotted peghead (normally offered on Taylor's GC8 model). All 800 Series LTDs feature the classic pairing of Indian rosewood back and sides with a Sitka spruce top, along with Taylor's CV bracing. Appointments include white binding, a design touch from years past, and the new Engraved Victorian inlay, which is laser-cut and etched from mother-of-pearl. Fans of Hawaiian koa will appreciate the 500 Series Limiteds (510ce-LTD, $3,798; 512ce-LTD, $3,898; 514ce-LTD, $3,998; 516ce-LTD, $3,998), which boast exotic koa backs and sides and a new Pipeline fretboard inlay. Inspired by the shores of Hawaii, the Pipeline depicts a circular wave fret marker design. The models also include a 3-ring koa fishbone rosette and Indian rosewood binding. Each of the 500 Series Limiteds is topped with Sitka spruce. Two all-mahogany electric models also join the Fall LTDs: the SolidBody Classic SB-X-LTD ($2,298) and the T3/B-LTD ($3,298). On the SolidBody Classic, the neck and body were milled from the same mahogany boards to create a perfect visual match. Both models include a traditional mahogany stain and vintage alnico humbuckers. For the Classic, the humbuckers are set against a parchment pickguard, while parchment binding outlines the T3/B-LTD. A Bigsby vibrato tailpiece and brilliant chrome hardware adorn the T3 for a ready-to-rock look that screams electric, vintage and cool. Each of the Fall Limiteds comes with Taylor's popular Expression System pickup and a hardshell case. The Limiteds are now available at domestic Taylor dealers. For additional details about the Fall Limiteds, please click here.